This weekend, Sweet Green Paper is on a Kindle Countdown sale. It will be 99 cents – 67% off its list price – through Sunday. Then it will go up to $1.99 for another three days, and finally will revert back to its list price on May 22. 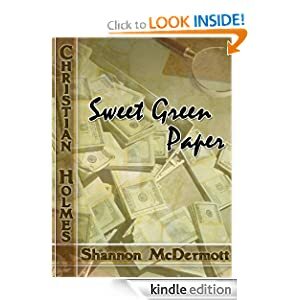 Sweet Green Paper is an Adventure of Christian Holmes, a humorous detective series. Excerpts are available on Amazon and on Goodreads. Christian Holmes is on the trail of a thief. It’s another day in the life of his private detective agency—until he’s shown a picture of the thief’s accomplice, and recognizes his own cousin. So he partners with his cousin in pursuit of a thief and the more elusive truth. All sorts of lies are told, when the reward is sweet green paper. Christian Holmes is a detective series, offering humor and moral themes. After years of living out his adventures on the pages of SALT Magazine, Christian Holmes has entered the world of e-publishing. 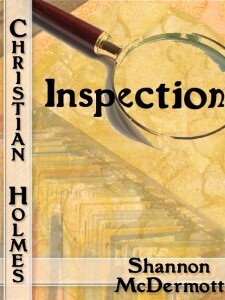 Two of his adventures are now available on Kindle Amazon: Inspection and Sweet Green Paper. I am putting out a call for reviewers – for anyone who will, in exchange for a book, post a review on Goodreads or Amazon (preferably both). Review copies will be given in MOBI, e-Pub, or PDF. The Adventures of Christian Holmes is a series of short detective stories, lighthearted and appropriate for younger audiences. If you are interested in reviewing one or both of these stories, e-mail me at info[at]shannonmcdermott.com. Please specify what format you would like, and where you plan to post your review. I’ve been busy this past week, with various projects. One of these was getting onto Amazon. The Last Heir is now on Amazon, eligible for free shipping and boasting one review. I also published Sweet Green Paper: An Adventure of Christian Holmes to Amazon Kindle. I enrolled it in KDP Select, making it free to rent for Amazon Prime Members. And getting, incidentally, free promotional days. A promotion is set for this weekend, September 14 and 15; Sweet Green Paper will be available for free download then. Beyond this, I’m busy editing my novella Summer Leaves (a companion story to Beauty of the Lilies) and making preparations to begin my next novel. Last Saturday I had thought I was about ready to write the first scene, but while planning it out, I decided to do some further research. I should stockpile some more scientific facts. And maybe read some more pulp fiction. Outpost of Jupiter wasn’t bad.